For more incredible artwork from apostles, check out Photo Gallery: Art of the Apostles. About 50 years ago, Elder Richard G. Scott went with his wife, Jeanene, to visit a friend and commercial artist. "It was fascinating to me," Elder Scott told the Church News. "I decided I wanted to try that. I did, and I was not very successful. Then I heard of an art teacher who was coming to town. I took four lessons from him, which equipped me with greatly improved skills and understanding about art." As the years went on, he appreciated the creative process of painting more and more. "I've found that when you're doing something like painting, a creative part of your brain opens; you gain insight and perspective about many things. For me, painting clears my mind. I think we discover we're capable of things we've never dreamed of," he said. The model for Little Daisy Girl is the daughter of Elder John B. Dickson of the Seventy and his wife, Delores J. Dickson. Photo from LDS Church News. Chinese Man was painted for President Gordon B. Hinckley because of his love for Asian people. Photo from LDS Church News. African Plain conveys the presence of beauty even in desolation. 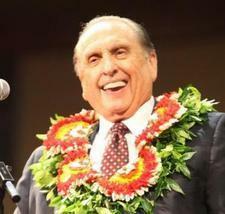 Photo from LDS Church News.